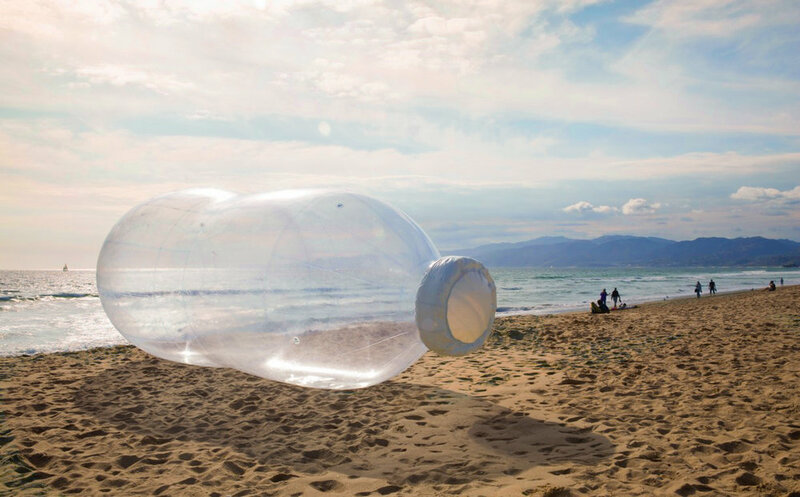 Artists Jana Cruder and Matthew LaPenta’s installation NATURAL PLASTICITY beckons viewers to examine their own roles and relationships with disposable plastics and the environment. The title references the adaptability of an organism to changes in its environment or differences between its various habitats, existing in or caused by unnatural additives; the changing of our natural environment due to the impact of disposable plastic. Looking back at the impact of the choice of disposable plastic. 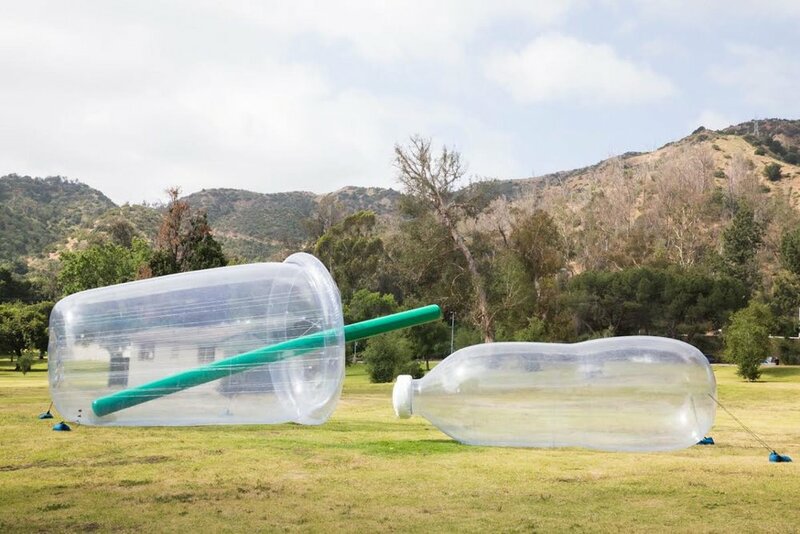 Made out of post-consumer plastic and representative of a single American consumer’s use of disposable materials, these larger than life inflatable art sculptures are part of a traveling series of trash aimed engaging public participation encouraging activism through art. 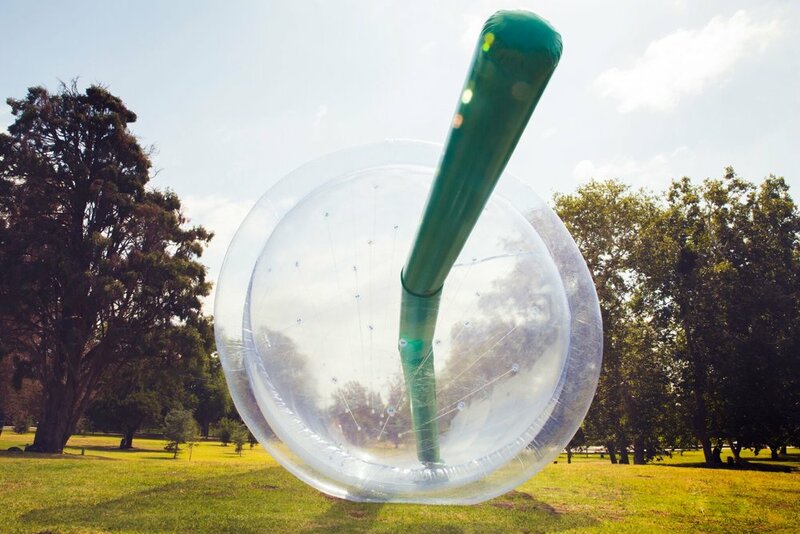 By working with inflatables the project has the ability to change locations throughout a city or geographical area over the course of several days. Mirroring the same way plastics interact with our natural environment. 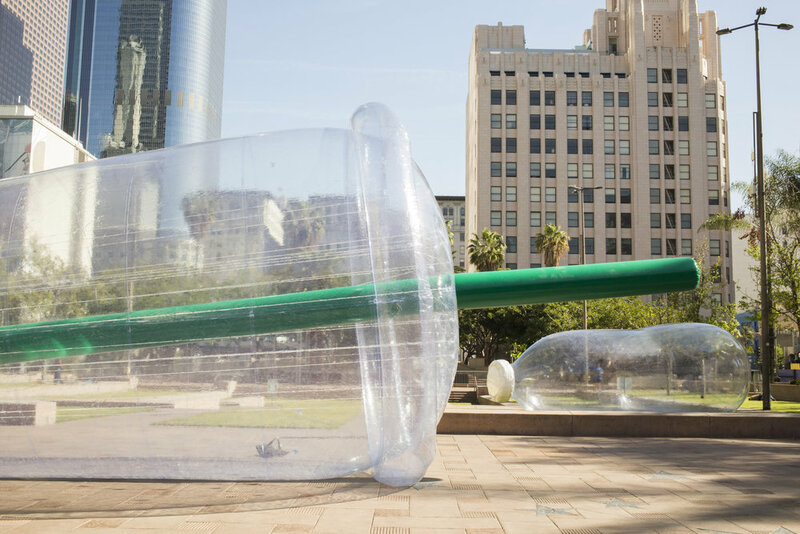 The installation brings the impact of consumer and corporate behavior regarding single-use-plastics into clear site. Beckoning the viewer to evaluate their own behavior with plastic consumption. In order to change what is manufactured and marketed we must first change the individual. 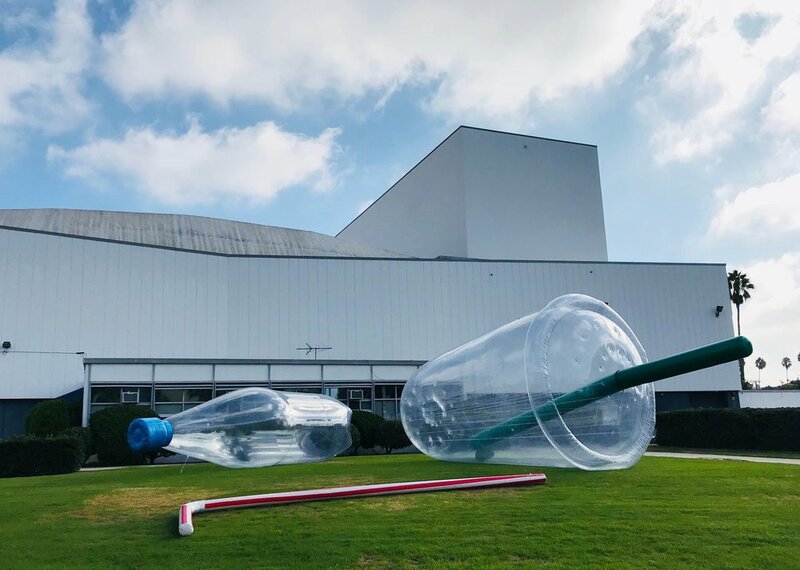 To positively effect consumer behavior we’ve decided to alter the local landscape by installing 20ft to 30ft replicas of a plastic bottles, plastic disposable cups and straws into interior and exterior environments. 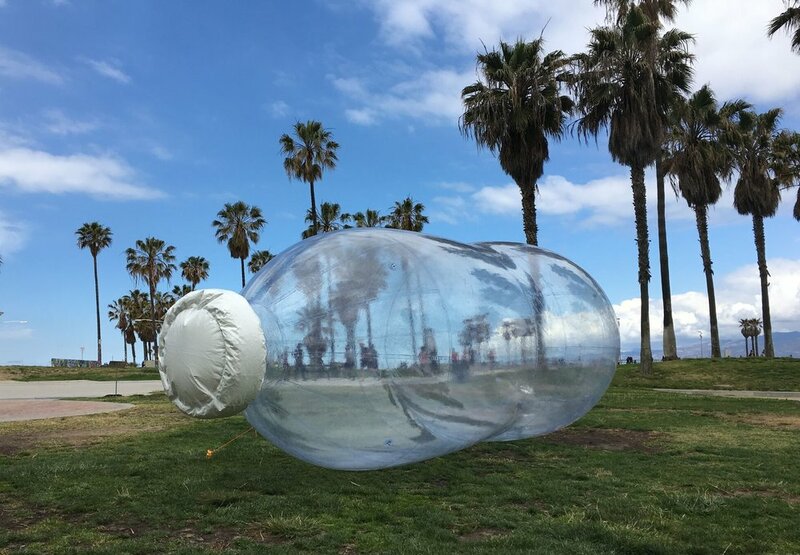 These larger then life objects, when placed in landscapes unaccustomed to art grab hold of the viewer and ask them to look inward at their own habits. California based artists Jana Cruder and Matthew LaPenta immediately found connections in the roots of their multimedia practices, respectively and started to recognize a dialogue between one another’s work. Cruder and LaPenta continue to use their individual art practices and unique identities as artists to explore new ideas and alternative aesthetic territories in a collaborative effort that is equally accessible as it is challenging. They are deeply moved by the current state of humanity and its impact on the planet. Through their current collaborative projects, they aim to cast a spotlight that is enlightening while also unassuming on the environmental, technological, political and social realities of today.